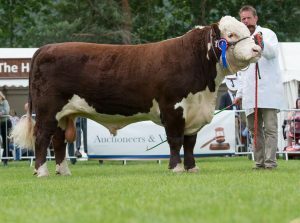 Northern Ireland certainly punches above its weight when it comes to producing quality Hereford cattle. Two dominant Herds have exported stock which have proved to be a keystone in Herds in the U.K. You don’t have to look far in a large percentage of pedigree’s to find either Dorepoll or Solpoll breeding. Both Herds not only provide quality show stock but provide an animal that that is backed by EBV’s and a great line of milk. The Haire and McMordie family are held in high regard throughout the UK, with progeny winning over the last few decades all over the British Isles. Even if your focus isn’t for the show ring NI have the highest percentage of Bulls sold into the dairy market, something James Sage Hereford Cattle Society’s Chief Executive spoke about at the recent association awards dinner, something he would like the UK to catch up on. 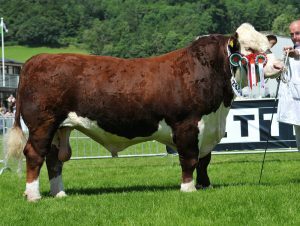 UK Bull of the Year Lowesmoor 1 Maverick, is sired by Dorepoll 1 499 High Society bred by the Haire Family from Dundrod. 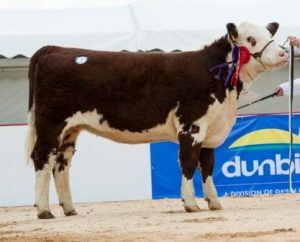 UK Female of the year Dendor 1 Jennefer 15th, who is by Solpoll 1 Gilbert bred by John & William McMordie from Ballygowan. This is the 4th UK Female of the Year award for a Gilbert daughter. UK sire of the year Solpoll 1 Gilbert, has took this title for the 3rd time. 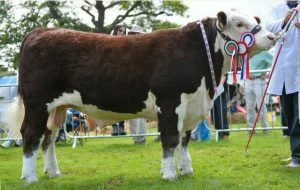 Dorepoll 1 499 High Society was also a previous Reserve UK Bull of the Year and also the Native Inter Breed Champion at the English Winter Fair Normanton 1 Pacific was sired by Dorepoll 1 Knight Hood. 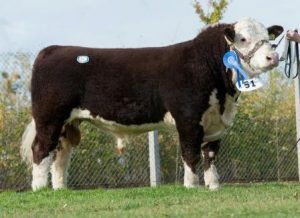 “A consignment of five well presented heifers from J & W McMordie, Co. Down, Northern Ireland were keenly contested with the first lot of the day Solpoll 1 Stardust N5 being purchased by G Hall, Pinmoor Herefords, Lancashire for 4,000gns. 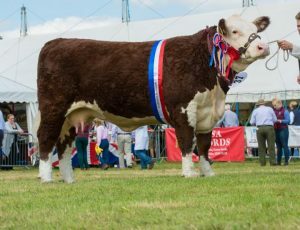 Two further Solpoll females; Solpoll 1 Starlet N28 and Reserve Grand Female Champion Solpoll 1 Starlet N26 were purchased by Speirs Farms Ltd, PepperstockHerefords, Luton, Bedfordshire for 3,800 gns and 3,600gns respectively. The final two Solpoll heifers, Solpoll 1 Starlet N9 and Solpoll 1 Starlet N32 were purchased by Warham Court, Breinton, Herefordshire for 2,800gns and 3,300gns.